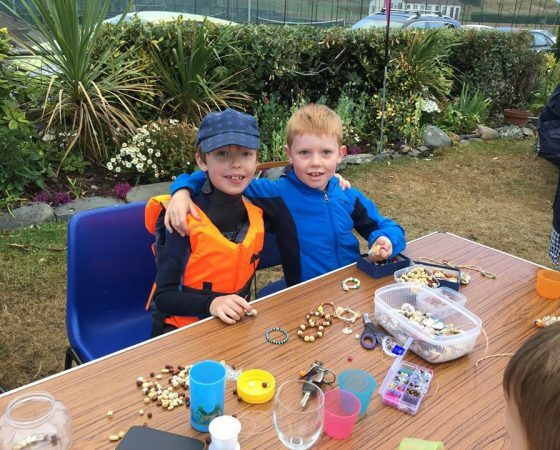 One of the club’s most loyal cadets has been showing his entrepreneurial skills by making amazing jewellery from shells and other items found on the beach and selling them to raise funds for Dolphins and Sharks, the junior section at BYC. Edward Martin (8) with the help of his pal Dessie Gillespie (8), set up a stall at the club on two Friday evenings and the jewellery sold like hot cakes! Not only did Edward sell them at the club but took them with him on his holidays to the North Coast. The Cadet Committee is very grateful to and proud of Edward, who along with donating £15 of his own pocket money, raised over £75 for Dolphins and Sharks.